The GoPro has ruled the action camera market for over a decade. Whether a professional or someone looking for a personal adventure video shooting device, GoPro has eased the job for everybody. Off late, Nikon the premier camera-manufacturing brand has introduced a series of Keymission action camera models. Recently, after the release of Keymission 170 (widely in glance for the 170 degree view), with features comparable to the GoPro Hero 5 Black, there is much hype among the buyers when making a choice. We have tried to give you every bit of detail and a comparative analysis on these two camera models to ease your decision-making. The difference of 10g weight is not a big issue while the Nikon camera has larger dimensions. The small GoPro has a cute compact design having an appeal in itself. Both these cameras have LCD display screen. You can control the menus, live streaming and other functions on the screen. With larger screen space and touch operation, GoPro is easy to handle. 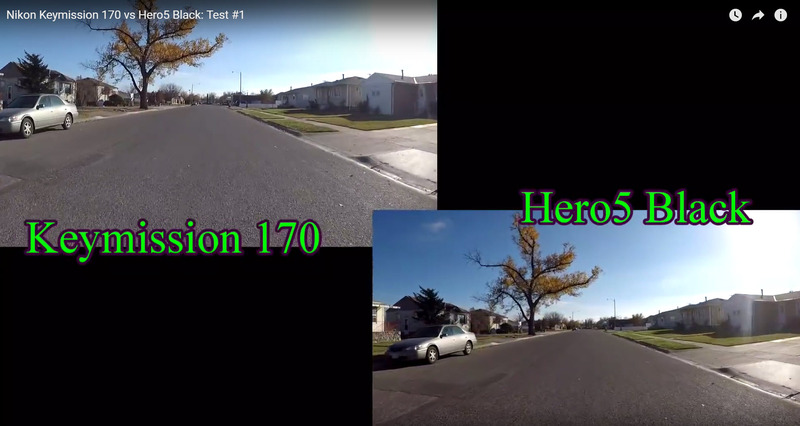 Comparing the screen, you will find better resolution, clarity and brighter display on GoPro. The Nikon Keymission 170 action camera features dual shutters- separate for video and still image capturing allowing lesser adjustments in the settings. Switching between the video and photo modes in GoPro is easy to do via voice commands or the menu. There is a notable difference in the performance of GoPro and Nikon when it comes to taking still images. With 12MP resolution (4000X3000 pixel settings) Hero 5 stands much ahead of Keymission 170 giving you the joy of capturing still photos at the resolution of 8.3MP (3840x2160 pixels). Another important convenience with GoPro is that you can take geo tagged photos besides the choice of shooting WDR and RAW photos. Nikon does not feature GPS configuration. You also cannot take RAW photos with Keymission 170. The video quality output of these cameras is the real point of attraction for all buyers. To all your relaxation, both of them can capture 4K30 (highest resolution) videos. Luckily, the quality of the videos is almost the same.Using the Protune settings on GoPro, you can get better results with sharpening, change ISO limits, take RAW videos with preferred audio settings, adjust the white balance etc. The first time users can use the default settings to capture good high-resolution videos. Keymission allows some limited adjustments with the Pro settings. You can obtain improved video quality by changing the white balance, exposure compensation and other details. When it comes to considering the availability of the video modes, the GoPro Hero 5 Black is the ultimate winner. You can get a range of video modes on this camera with varied pixels and fps combinations. The Keymission offers fewer choices to set the video capturing modes. The GoPro works fine for the professionals looking to capture industry standard videos at 4K resolution.At normal speed, you can choose to set video modes at maximum of 2160p shooting at 30 or 25 fps. You can adjust the frame rate from 25 fps to 60fps while shooting at 1080 pixel resolution. These adjustments are sufficient if you are a beginner and want to get handy with action cameras. As the name suggests, the Keymission 170 only offers the standard view of 170 degrees only. The degree is reduced a bit less when you are using the image stabilization feature. With flexible frame rate adjustments and resolution, you can use several FOV options including superview, wide, linear, medium, narrow etc. with GoPro Hero 5 Balck. The video stabilization in Nikon Keymission 170 action camera is more advanced especially when you are using the external Gyrostabilizer. Nikon Keymission gives you an amazing feel with the yellowish orange effect when using the default white balance. This is much enhanced compared to that on the GoPro Hero 5 black. 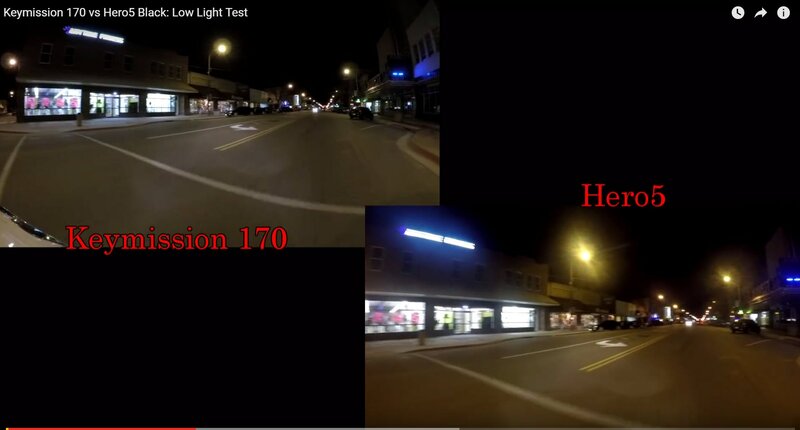 GoPro supports automatic white balance adjustment according to the ambiance and lights. While this feature is very advanced in the latest, model but not as that of the Nikon effect. There are shortcomings with both these cameras when you are shooting under low light availability. Yet, GoPro is a bit advanced to give you good video quality under low light. With Nikon it is preferable to use extra lights if you desire to get bright sharp objects. The Hero 5 Black is very tactically designed with dual microphones – at the rear and front ends. The camera can auto switch microphone during video capturing based on the requirements. To give you better sound quality, the camera swaps to the back microphone during heavy disturbing noise coming from the front direction like biking under heavy wind speed. The Nikon Keymission 170 action camera has built in stereo microphone to produce medium quality satisfactory sound capturing. Both of these are waterproof cameras and safe to use underwater at a depth of 10m. If you are going beyond 10m, the GoPro housing gives you the convenience to travel up to 60m deep while Nikon housing gives protection at depths up to 40m only. As far as the other protection features are concerned, GoPro lacks dust resistance, freezer sustenance and shockproof protection. The Nikon Keymission 170 action camera with 2m shockproof protection can sustain knocks, shakes, jerks and bumps to some extent. Perfect for freezing points up to -10C/14F, the camera is your best friend while skiing, snowboarding, snorkeling and going underwater in cold weather. Both these cameras function on lithium ion batteries (provided with the camera). GoPro Hero 5 Black offers improved battery version allowing you to shoot 4k @ 24 fps videos for 2 hours. With the same settings, the Nikon battery will last for an hour of shooting. Both these cameras allow connectivity via Bluetooth and Wifi. The Wifi functions superbly to support live video streaming, photo capturing with apps etc. 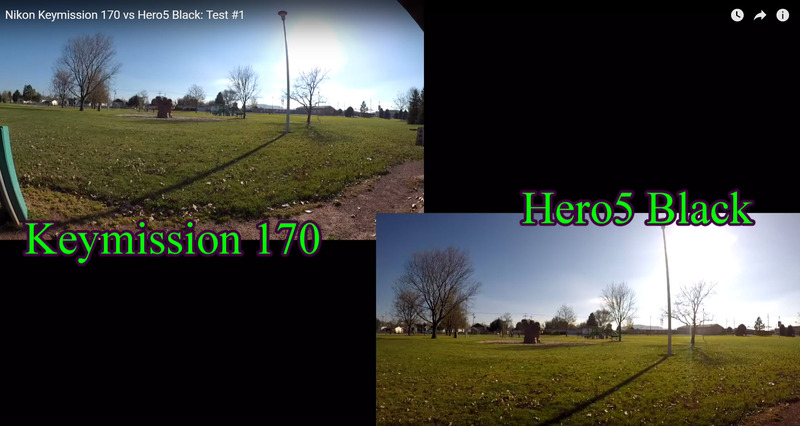 Both Hero 5 Black and Keymission 170 allow app access on Android and iOS platforms. The Nikon’s SnapBridge app poses bug issues blocking seamless operation. As compared to this, the GoPro has a series of mobile apps you can use as per requirement. Apps like Capture, Quik and others make your camera operation easy. However, some of them may have error problems. It is better to choose in context to user ratings. As with the pricing, both these cameras are available at almost the same range. 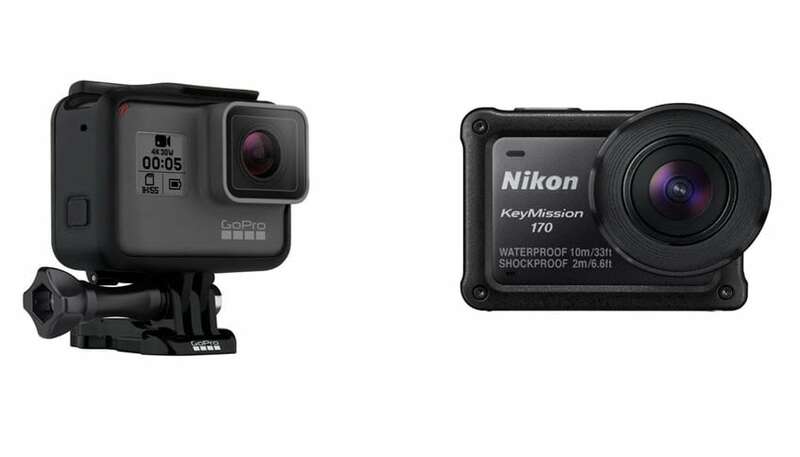 As far as the Nikon vs. GoPro comparison on technological specifications are concerned, it is obvious that the Keymission 170 is a bit lacking in advancement. The model is somewhat near to the earlier GoPro Hero Session model priced at $199. With the same perfection and some extra detailing, Nikon at $399.99 is not worth any match for the GoPro Hero 5 Black.